Our USDA label has been approved and our beef is now available for sale around Edna, Texas as well in the greater Austin area. We sell whole and half animals on the hoof. Follow us on Facebook to see where we’re going to be selling beef, or contact us at crose@cactusroselonghorns.com to place an order or call us at 361-781-4269. We raise Registered Texas Longhorn cattle, icons of Western culture, simply because we find them beautiful. Sale of grassfed Longhorn beef is truly secondary to growing our herd and producing gorgeous animals that epitomize this unique breed. Through thoughtful breeding, the animals in our small herd exhibit classic breed attributes such as climate adaptability, disease and parasite resistance, and trim physiques with less muscle marbling. What does all that mean to you, the beef consumer? Because we are raising a small number of animals to exemplify the Texas Longhorn breed, we have no need or desire to ever supplement their feed with hormones or antibiotics to produce a “fat” cow. We love to see our naturally trim cattle grazing on pasture that we fertilize with an organic kelp derived fertilizer. We are not a crowded commercial beef operation, and our herd has room to roam and soak up the Texas sunshine. When the herd size needs to be reduced, we use that as an opportunity to offer up grassfed and finished, organic, hormone free, antibiotic free, humanely raised beef to nourish our family as well as yours. Unfamiliar with the health benefits of eating grassfed beef? Visit The World's Healthiest Foods website to learn more. The small amount fat you can see will be more yellow than white. Grainfed beef will usually have a thick layer of white fat. There will be little marbling visible. The taste will be noticeably richer and “beefier.” We like to say it just tastes better! The meat will usually have a firmer texture when cooked. 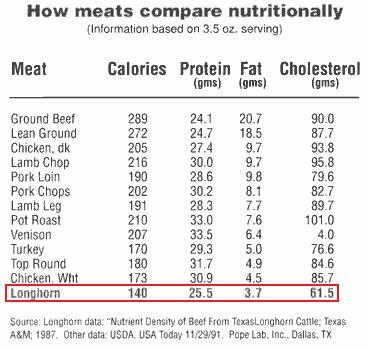 Longhorn beef does not require additional fat for cooking. The natural fat is enough to cook your meat to perfection. However, you can certainly add a healthy cooking fat of your choice like tallow, grass fed butter, coconut or olive oil. There is little shrinkage in Longhorn beef. A medium-hot fire works best in grilling. Add damp mesquite or cherry wood chips to the fire for extra flavor. Remember, the meat cooks quickly so watch it carefully. Longhorn beef roasts should be cooked at 275 degrees F. A meat thermometer is recommended to monitor desired doneness. Ground beef should have an internal temperature of 160 degrees F.
For steaks, salt your meat ahead of time with kosher salt up to a day or two in advance but a minimum of 30 minutes. Salting early seasons the beef all the way through and it’ll be more moist and tender. Live Weight: The weight of the entire living animal. Hanging Weight: Sometimes referred to as the hot carcass weight, this number is taken after the slaughter but before trimming begins. This weight includes the bones and organs. Final Weight: Sometimes referred to as the take home weight, this number represents the total pounds of usable cuts after trimming. When buying whole or half animals, we strongly recommend you consider selecting bone-in cuts to get the most for your money (and bone-in cuts are delicious!). Bones can be purchased separately for making broths and stocks, or even dog treats. The same can be said for organ meats and cuts like oxtail or tongue. Consuming as much of the animal as possible is not only respectful to the animal that is nourishing you but nutritious and economical! Visit the Texas Longhorn Breeders Association of America website for more information on Registered Texas Longhorn Beef.